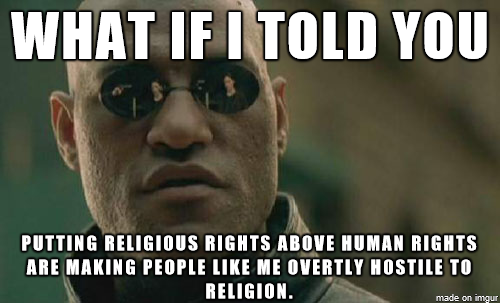 Treating homosexuals as second-class citizens. Insisting on prayer in schools. Insisting on special treatment by governments and the public at large. The rest of the supernatural hooba joob could be a 'My Little Pony' cartoon playing in the background for all that most people care... But theists insist that everyone must watch it. They are conditioned to see any dismissal / non-acceptance of their perspective as an assault on their perspective.